A canal safari along the pristine waterways of Tortuguero National Park reveals a stunning variety of tropical flora and fauna. Enjoy splendid volcano views from the relaxing mineral springs of your Arenal resort! Personalize your trip with the included guided adventure of your choice at Arenal. Travelers love our resorts in Arenal and the wide range of activities available... So feel free to addd extra nights here – or at any of our fine resorts and lodges! Manuel Antonio is the crown jewel of Costa Rica’s national parks... Let our expert naturalist guide reveal the many natural wonders of this pristine coastal reserve. As you venture from the Caribbean to the Pacific, our expert guides make this diverse Costa Rica vacation truly fun and rewarding. Check in to your hotel, the first class President Hotel or the deluxe Grano de Oro, an award-winning boutique hotel set in a restored Victorian mansion in the heart of the city. Today’s shared transfers over land and water bring you to the less-visited Caribbean coast, a pristine region renowned for its diversity of flora and fauna. Upon arrival, check in to the lodge of your choice, the first class Mawamba Lodge or the deluxe Pachira Lodge. 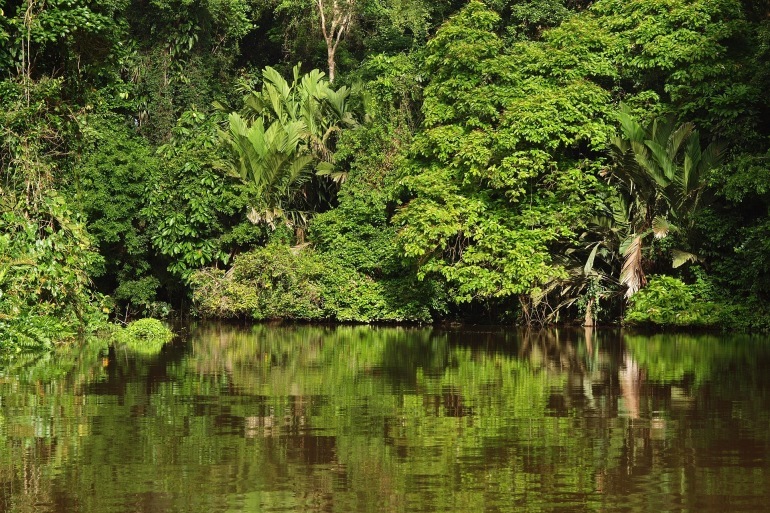 In the afternoon, join your guide for a tour of Tortuguero Village. After breakfast, enjoy a guided nature walk along the rainforest trails of your lodge. Guests at Mawamba will also visit the Lodge’s own small Butterfly Farm, Ranarium and Iguana Farm. Often referred to as “The Amazon of Costa Rica,” Tortuguero is a tropical wetland filled with exotic flora and fauna waiting to be discovered. This afternoon, you’ll set out in a boat that’s been specially designed for these canals. As you explore the extensive network of waterways that wind through the wildlife-rich vegetation, your expert naturalist will offer fascinating insight into the region’s fragile eco-systems. Please Note: A $10 Park Entry Fee is not included and must be paid directly at the Park’s entrance. This morning’s scenic shared-boat transfer continues overland to Guapiles for lunch. In the afternoon, continue with your own private car and driver to Arenal, where you’ll check in to the resort of your choice. The charming Montana del Fuego is set on a private tropical forest reserve at the foot of Arenal Volcano. Or delight in the luxury of Arenal Kioro Suites & Spa; the region’s finest 5-star resort boasts spacious guest suites, each with two private terraces and unparalleled volcano views! - La Fortuna on Horseback: A 90-minute ride and an invigorating hike along forest trails bring you to this lovely waterfall. Don’t forget to bring your swimsuit. There’s an enchanting natural pool that’s perfect for a refreshing dip! -Hike Arenal: Enjoy a moderate hike through the forest and over old lava flows as your guide offers fascinating insight into the unique geology and ecology of this geothermal region. - Suspended Bridges: Explore along more than a dozen suspended bridges that wind their way through the forest. It’s a great way to study the tropical flora and fauna of the canopy. And high above the forest floor, you’ll catch great views of Arenal Volcano! - Zip-Line Adventure through the Canopy: Adrenaline-rushing adventure awaits with 12 platforms and over 1,000 feet of cable strung through the tree tops. Gain a new perspective of the rainforest as you “fly” through the trees – attached by harness to the steel cables. - River Float Safari: The gentle Penas Blancas River makes its way through the lush forest, alive with tropical birds and wildlife. This guided, family-friendly adventure is a relaxing and wonderful way to explore Costa Rica’s diverse flora and fauna. After your morning activity, travel with your private car and driver to Manuel Antonio National Park, regarded by many as the crown jewel of Costa Rica’s national parks. Upon arrival, check in to the resort of your choice. Perched high on a summit, the first class El Parador Spa Resort offers breathtaking views over the Pacific. Or immerse in the award-winning style and luxury of Si Como No. Please Note: You can add an extra night at Arenal from only $69 per person! We make it easy and more enriching to explore this magnificent National Park, widely regarded as the crown jewel of Costa Rica’s extensive national park system! With Park entry fee included, enjoy a fascinating guided hike through this pristine coastal forest. Manuel Antonio is renowned for its beautiful palm-fringed beaches, spectacular rocky headlands and forests rich with wildlife. Today is yours to enjoy and explore as you wish. Relax by the pool of your idyllic resort, stroll along the beach or join an available excursion such as white water rafting, kayaking or horseback riding. Your tour with us ends this morning after breakfast. Extensive naturalist-guided excursions and a choice of adventure activity in Arenal Hotspring. 12 meals: 7 breakfasts, 3 lunches and 2 dinners. 7 nights accommodation in your choice of first class or deluxe hotels and lodges. All on-tour transportation and all hotel taxes and service charges. General Assistance, our toll-free 24/7 emergency on-tour assistance. Our easy-to-add extension includes accommodations, guided excursion and all on-tour transportation. Hailed by National Geographic as the “most biologically intense place on Earth,” the extraordinary diversity of Corcovado National Park on the western edge of the remote Osa Peninsula makes this the perfect complement to your travels through Costa Rica! 7 breakfasts, 3 lunches and 2 dinners. An iconic landmark in San Jose, Costa Rica, Hotel Presidente is a contemporary urban retreat in the heart of downtown San Jose. With its vibrant ambiance, modern décor and great service, our 4-star upscale hotel is the symbol of hospitality and the cultural soul of Costa Rica's capital city. Celebrated for our eco-friendly tourism practices, Hotel Presidente is a window into Costa Rica's land, people and heritage. Experience an unforgettable vacation adventure, romantic getaway or business trip at our hotel, the place to relax, connect, inspire, dine, and explore Costa Rica! The Montana de Fuego resort is located in La Fortuna, and is privileged to be in one of the most beautiful regions in Costa Rica. All lodgings are built in a way as to accent and not impair the natural beauty of the land, and are equipped with a view, telephone, cable TV, private terrace, and air-conditioning. Additional hotel amenities include pool, gift shop, and exploring locally. Hotel Parador Boutique Resort & Spa is located on Punta Quepos in the most pristine and tranquil area of Manuel Antonio, yet within minutes from the World Famous Manuel Antonio National Park and the small sport fishing town of Quepos. Surrounded by beautiful gardens and astonishing views, all our rooms have balconies or terraces with views of either the rainforest or the ocean. All 108 rooms are tastefully decorated with luxurious extras, including room service, cable TV, air conditioning, mini-bar, coffee maker, telephone, safety deposit box, iron and iron board, ceiling fan and hair dryer. Cancellations for are subject to penalties of $1000/person up to 31 days, and 100% of program price if canceled within 30 days. Alexander+Roberts offers a Travel Protection Plan that provides protection for your travel arrangements, your belongings and most importantly, you. Please see our Travel Insurance page for complete details.